733.99 Other disorders of bone and cartilage; diaphysitis, hypertrophy of bone, relapsing polychondritis. Sesamoiditis: tendons surrounding the sesamoids become irritated or inflamed. Common in ballet dancers, runners and baseball catchers. Bipartite tibial (medial) sesamoid is common: 10% of population, 25% will be bilateral. 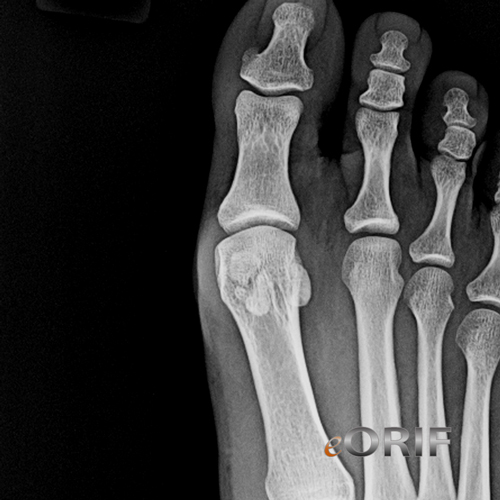 Fibular sesamoid rarely is bipartite. tibial sesamoid stress fracture, the initial treatment of choice is cast immobilization. Excision, partial excision, and bone grafting are reserved for refractory cases. Cortisone injections, taping, and pads do not adequately immobilize the sesamoid. (ahss MH: The sesamoids of the hallux. Clin Orthop 1981;157:88-97. Coughlin MJ: Sesamoid pain: Causes and surgical treatment, in Green WB (ed): Instructional Course Lectures XXXIX. Park Ridge, IL, American Academy of Orthopaedic Surgeons, 1990, pp 23-35.